Belkin has announced the Australian availability of its USB-C 3.1 Express Dock HD. “There is increasing consumer demand for more power, more connectivity and more convenience, and we’ve answered that call with this new dock,” said Andrew Camba, Director of Product Management, Belkin. Delivering speed, power and efficient charging through a single one-metre cable, this new dock allows consumers to connect up to eight devices and take advantage of 4K HDMI video output, gigabit Ethernet connection, and crystal-clear audio in and out. 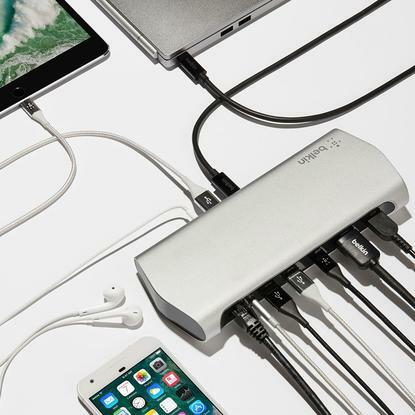 Belkin say that Power Priority technology keeps the main device charged while sending 60W of power delivery where it’s needed by assessing each connected device’s size and charging needs, then distributing power accordingly so all devices receive an optimal charge. The new USB-C 3.1 Express Dock HD is available now at Harvey Norman, Belkin.com and leading retailers across Australia and New Zealand.